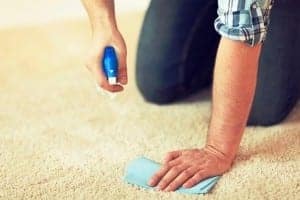 Aside from recommending that you don’t serve red wine or coffee, here’s a simple guide for treating stains and maintaining carpets and upholstery. Always clean up spills quickly to avoid staining. Start by removing any solid debris. Clean the spill using clean, cold water and blotting with white paper towels or cloths. Never scrub or brush the spill as it will damage fibers and possibly set the stain. Regular vacuuming and spot treatment will improve the quality and life span of your carpets and upholstery. Since chemicals are hard on the fibres of carpets and upholstery, you should always start with mild cleaning solution before moving on. Start with clean water and move onto a mild solution of liquid soap (never use laundry detergent) or an oxygen based cleaner which usually works well on organic stains (food, animal, blood) before using chemical spot removers. Test the cleaning products for carpets or upholstery in an inconspicuous spot to make sure there are no adverse reactions or staining. Place a white paper towel or cloth on the tested area to check for color transfer. If the spot cleaner is safe apply a small amount of spot removal product to a clean, white cloth and work your way from the OUTSIDE of the stain inwards. Upholstery stains can also be treated with a 3% Hydrogen Peroxide solution that can be left on and dabbed. You do not need to rinse. Hydrogen Peroxide works equally well on vinyl furniture. When the stain is removed rinse with clean water and blot the excess out. Replace towels when they are too wet to absorb anymore water. Be careful to avoid over wetting as it can cause water marks and also damage your carpet or cause mildew in your carpet or upholstered furniture. Taking the time to treat spills before they become stains will go along way in keeping your carpets and upholstery looking as good as new! Side Note: If you are unsure about what you are doing and are not confident call a professional carpet or upholstery cleaner. Always test any procedure on an inconspicuous area before starting.